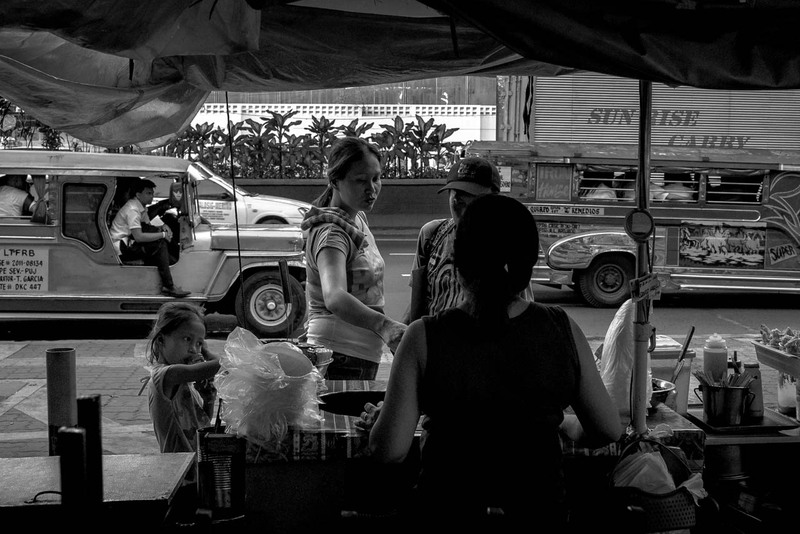 A street vendor prepares breakfast for this family of three, with the morning rush hour traffic serving as a backdrop to their daily routine. Plaza Rueda, Ermita, Manila. Breakfast from street food vendors, a cup of instant coffee and the occasional cigarette, seems the practical choice for the everyday, masa commuter, at least in these parts. Others, perhaps those with slightly deeper pockets crowd the nearby row of fast food joints. At around 7:30am, the little plaza starts to fill up with students, office workers, vendors and people getting on and off the LRT and queuing for pedicab rides. In the middle of the public space, a police unit gets itself in formation while waiting for their commanding officer. I’ve started using the 35mm Summicron again on the Sony A7SII after spending the past few months on a Super wide, and I must say, shooting a 35mm feels like I’m on a 50mm after using a 15mm for so long. See flickr for EXIF. Filed under Street Photography. Tagged as 35mm, Black and white, Ermita, Manila, Sony A7SII, Street Photography, Streets of Manila, Summicron.